The strongest companies in any industry achieve their objectives by defining the “criteria for success” before initiating any project or endeavor. Many companies define “success” in terms of scope, schedule, budget, and quality. Others define it in terms of “significant value” for the organization upon project completion. At JCS, we respect both definitions recognizing that “significant value” may include: lower cost of ownership, reduced downtime, maximized product yields, and/or increased efficiencies. Proper control of project scope, schedule, budget, and quality are key in achieving the desired significant value. Scope creep – Scope is everything you’re going to do…AND everything you’re NOT going to do. Poor communication – Surprise! Is the enemy of all project stakeholders. No risk management – Every project has risk. Plan to mitigate it. Unsupported project culture – Stakeholder “buy-in” is critical to project success. Uncontrolled changes – Changes occur. Document them in terms of schedule, budgets, etc. The best practices of successful companies include the use of a new product development process referred to as “Stage-Gate” or “Phase-Gate” development. While JCS continues to “standardize” our food processing equipment like aseptic barriers, batch systems, blenders, etc., we realize that our customers are as varied as the products they produce. We plan, design, and build each system to meet each customer’s specialized needs. 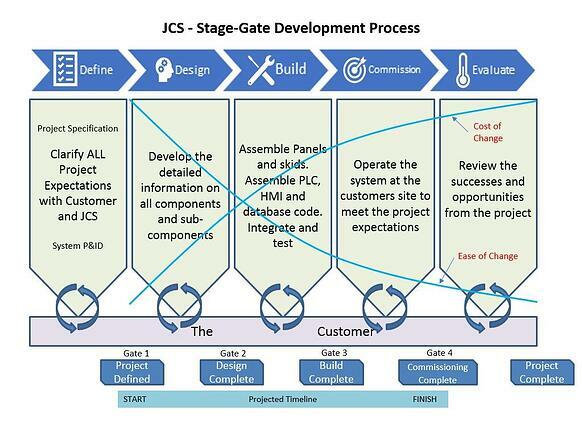 At JCS, using a modified form of the Stage-Gate new product development process, we help our customers achieve their project objectives by avoiding the main reasons projects fall short. Project development is divided into five stages, which represent five bodies of work: Define, Design, Build, Commission and Evaluate. A graphic representation of this Stage-Gate process is shown in Fig 1. This first stage is when the actual scope of the project is defined. Two specific tools are shown: Project Specification and the System P&ID (Process and Instrumentation Diagram). Use of these tools ensures that both the customer and JCS understand the scope of the project. The second stage is when all the calculations, designs, layouts, configurations, control logic, parts orders, etc. are completed according to the scope of the project as determined in stage 1. This stage is when physical assembly, integration, and test takes place of all instrumentation, control panels, skids, and software packages specified in the Design stage. During this stage the hardware and software assembled and integrated in the previous stage has been delivered to the customer and is validated and commissioned at the customer location. At the completion of this stage the equipment is completely functional to project specifications. The project can not be considered complete until both the customer and JCS have had the opportunity to review the project for successes as well as opportunities for improvement. Notice, at the bottom of each stage, there is a cycle of communication between JCS and the customer. This indicates that timely communication is essential throughout the project and that communication must flow in both directions as new information becomes available. This is not just the exchange of project status but also risks, mitigation plans, change requests/approvals, priority shifts, and any information which may affect the project. The graphic also indicates with two light blue lines how changes affect the project based on the stage at which those changes are entered in the process. Changes early in the process are much easier and less expensive as compared to changes entered during the later stages of the project. While this process may seem cumbersome and perhaps, radically different from past experiences, following the Stage-Gate process will help allay the reasons many projects fall short of their objectives. In partnership with JCS, this discipline manages projects to meet scope, schedule, budget and quality objectives while empowering our customers to realize targeted significant value to their organizations. So, how do you spell success? -- JCS. 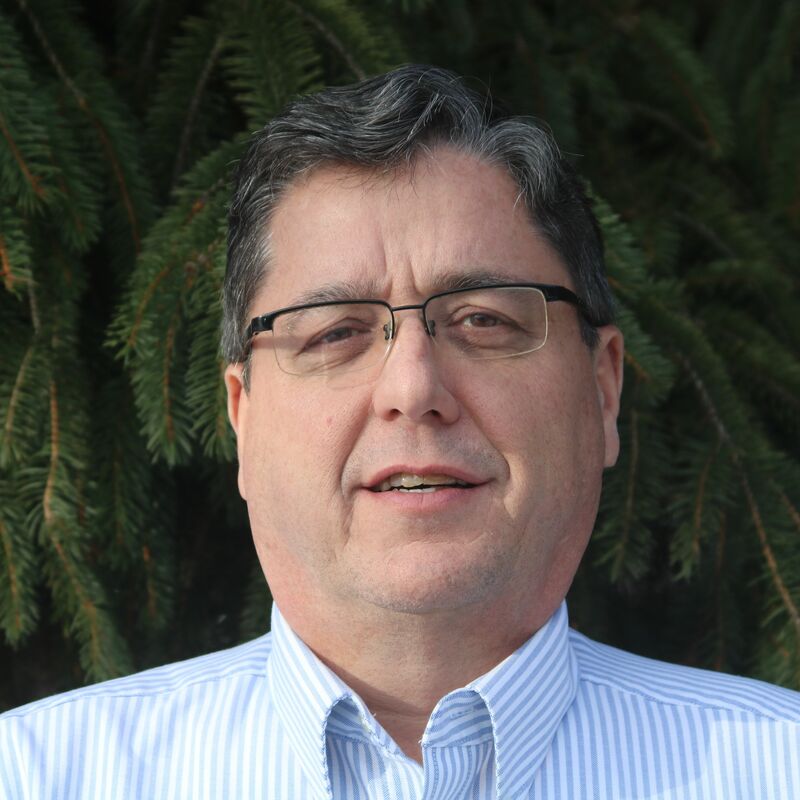 Electrical Engineering Manager – Joining JCS in 2014, Greg has more than 25 years of experience innovating, engineering, problem solving and developing commercial and consumer products related to the food & beverage industry. He has been awarded multiple patents for equipment controls. He understands the international engineering mindset having led engineering teams in China, India, Europe, Mexico and the US.